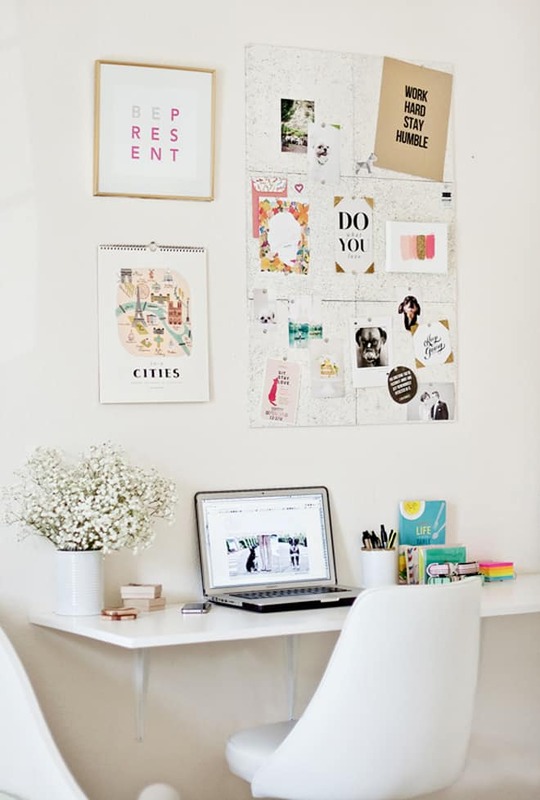 These 10 creative, small office design ideas are easy ways to make your office both efficient and stylish! 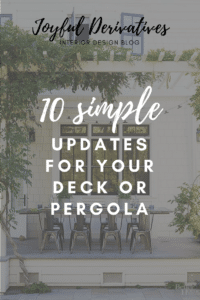 So… exciting news – I’m hoping that sometime in the very near future I will have an office space for both the blog and my interior design consulting business!! It’s all still in the works, but of course, it’s got me thinking (A LOT) about how to decorate this future office… It’ll be small (around a 10’x12’ space) and so I know I’ll need to be efficient with the space and really maximize its functionality. In my search for inspiration, I thought it would be fun to share with you 10 of my favorite small office design ideas. These 10 offices are super functional and each one has a specific design element that makes them so effective. 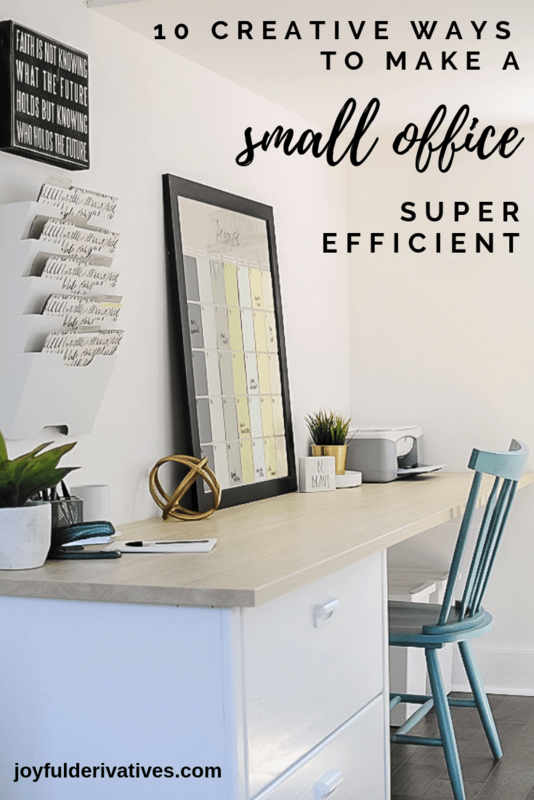 I’m hoping those of you with small office spaces, whether at home or work, will be inspired by the designs of these rooms and that you’ll walk away with some ideas for how to make your office space more efficient. Enjoy, friends! The use of a pocket door allows you to furnish the room without having to worry about where the door will swing open. In a small space, this is valuable real estate! 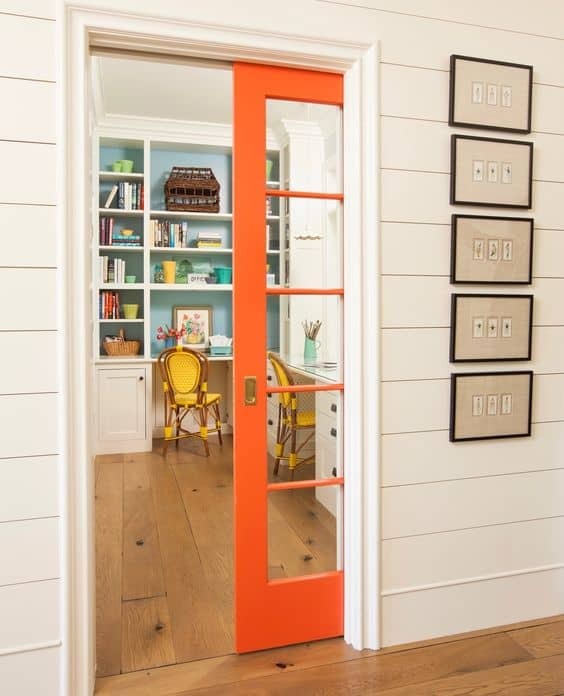 Try installing a pocket door in leu of a traditional door to save space and for extra style, paint it a bright color! 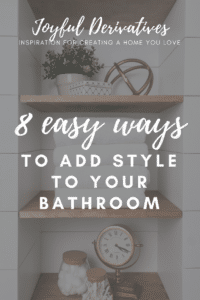 If you’re hoping to have a two-sided desk for meeting or conversational purposes, adding bookcases on the wall behind the desk will add much needed storage. Try painting your walls a dark color to make the room more cozy and then use a fun patterned wallpaper in the back of the bookcases to help them pop! Another option for creating a two-sided desk for meetings is to install an “L-shaped” desk. This allows you to have two workspaces – one for the computer work and one for meetings. If your room allows for it, this is a great use of space! Try installing shelves above the side against the wall for extra storage. If your small office is also part of another room in the house (ie. a bedroom or the kitchen) then hidden storage is going to be your best option for creating functional space that’s also beautiful to look at. 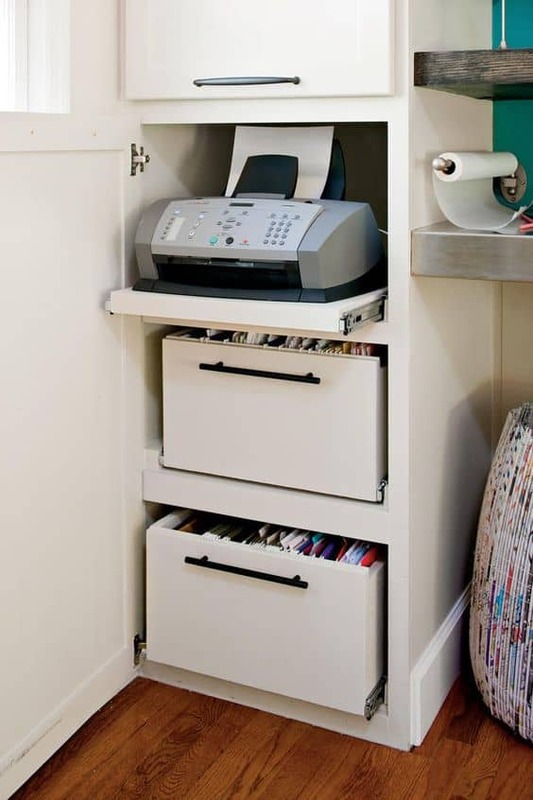 Try putting your printer or files inside a traditional cabinet for something both stylish and efficient! I love this cork-board wall idea! Chalkboard walls are currently a large trend, but I always struggle with the “mess” of chalk. This cork-board idea is a great one because it can replace both a whiteboard or chalkboard (with notes pinned up) and an inspiration board. 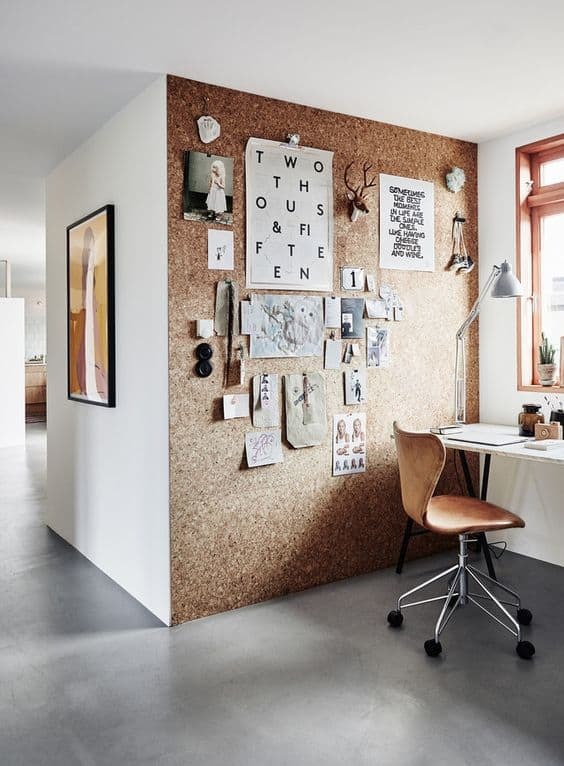 Don’t have a small enough wall to use or not a fan of THAT much cork-board? Try doing just the top half of your wall in cork-board and then install some board and batten wainscoting underneath! 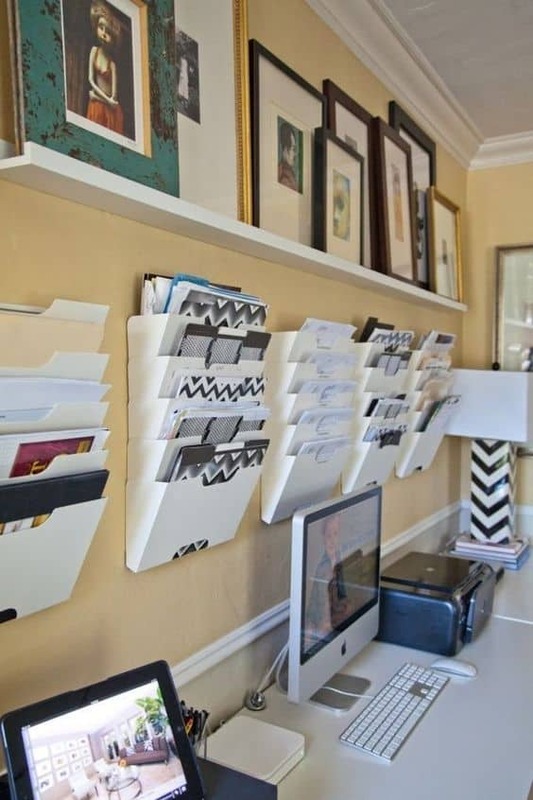 I’m a huge fan of paper files and love this idea from apartment therapy for installing a row of file holders above your desk! It makes the files you’re currently using easily accessible and looks pretty too. Have you all seen the amazing “murphy” desks available these days? They’re a perfect way to have a desk in a really tight space where you don’t want one sitting all the time. The desk shown above actually folds up against the wall when it’s not in use and looks like a chalkboard hanging on the wall! Kitchen desks have always been trendy, but I love the way this one sits in this tiny corner nook. 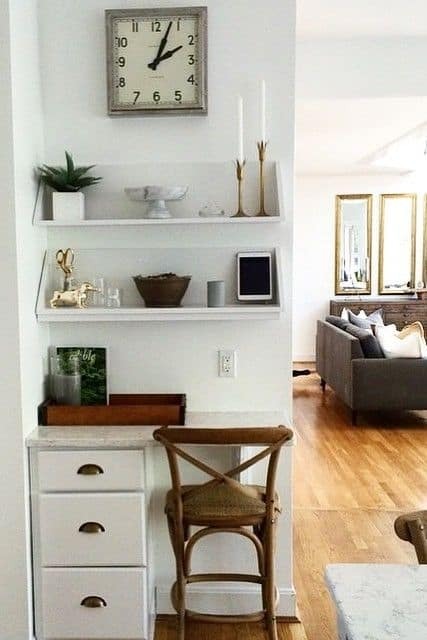 Many homes have small nooks like this that go unused or simply display unneeded furniture. Why not turn it into a functional office? 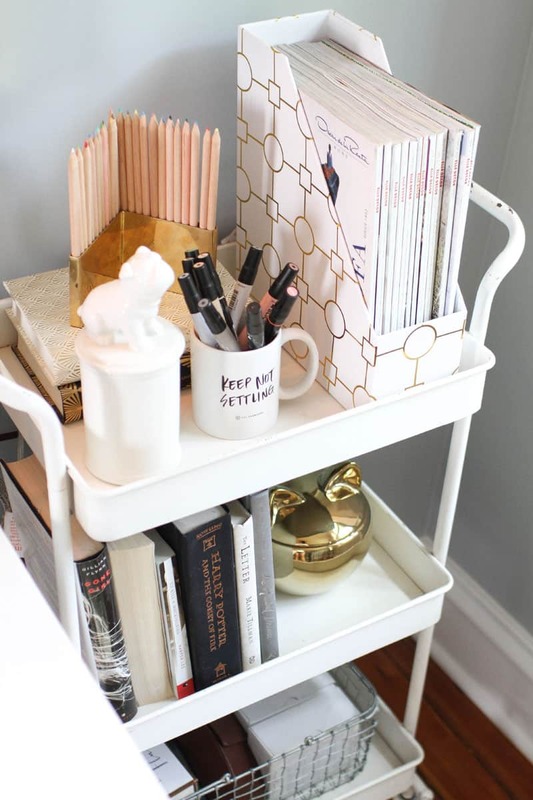 I’ve always loved these bar carts from IKEA, so when I spotted this idea to use it for desk storage, I was super excited! Not only does this look beautiful, but it’s also on casters so you can easily move it around as you need within your space! You’d be amazed by how much larger a space feels when the furniture is up off of the floor! 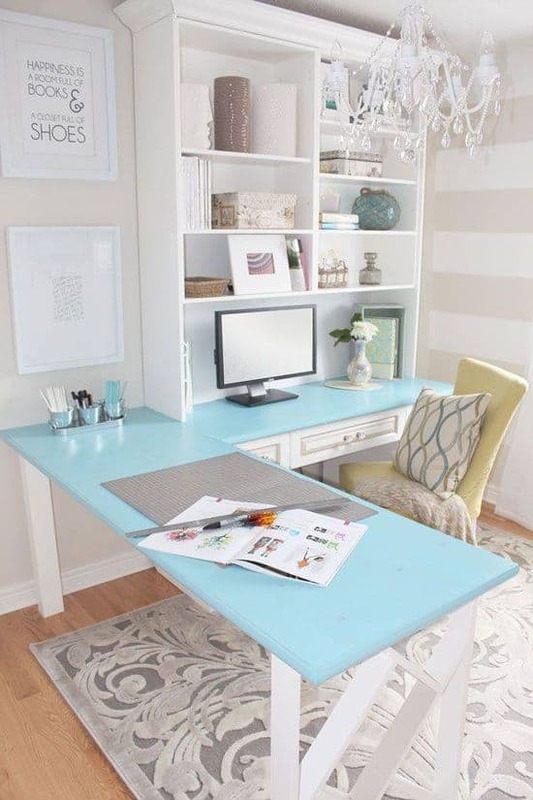 I love the way this floating desk doesn’t lack any style and yet the room feels both open and airy. Try installing a shelf that’s the same color as the walls for a seamless look. So, what do you think? Awesome small office design ideas, right? 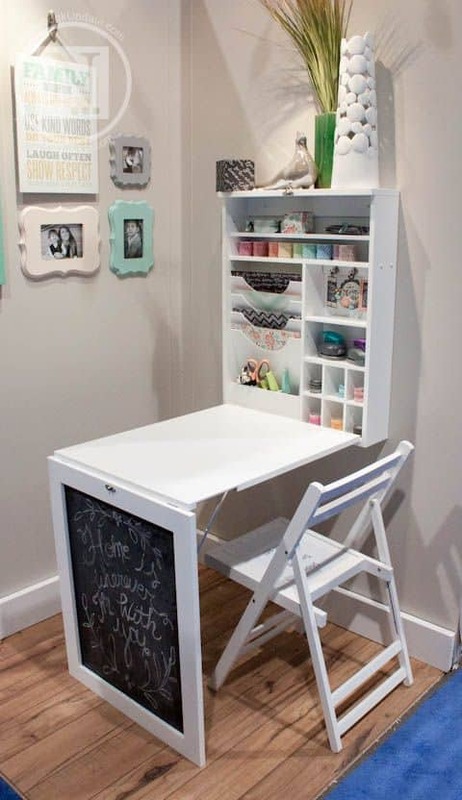 I used many of these ideas in my small office she-shed! Have a fabulous rest of the week, friends! These techniques will help to change every house splendidly!! Thanks for the wonderful tips.